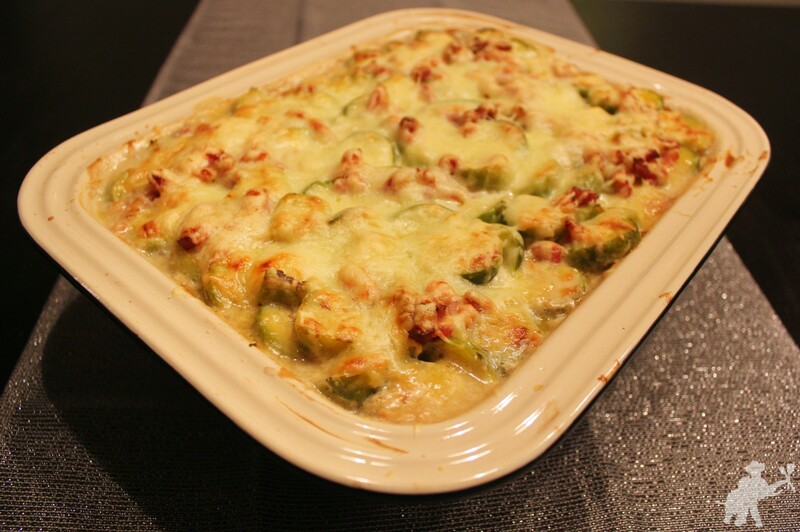 Potato gratin is a great winter dish. This recipe adds our Veggie of the Month to this already awesome, creamy version. 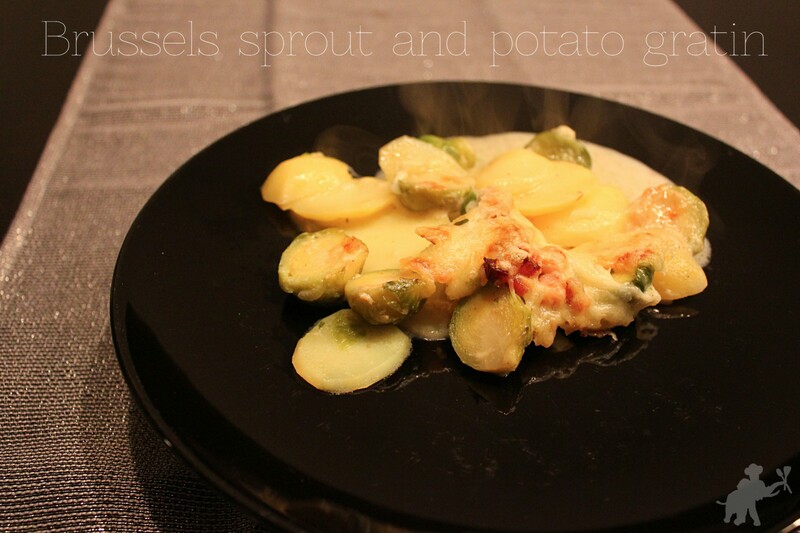 The slightly bitter Brussels sprouts go perfectly with the sweet taste of potatoes and cream. Preheat the oven to 200°C/390°F. Butter a casserole dish. Peel the potatoes and cut them into very thin slices. Rinse the Brussels sprouts, remove the outer leaves and cut them in half. In a small saucepan, sauté the bacon over medium-high heat. After 2-3 minutes, add the shallots. When the shallots turn soft brown, deglaze with the white wine. Stir to dissolve what has caramelized on the bottom of the pot. Then add the cream and broth, season with salt, pepper and nutmeg. Add a lot of salt – the potatoes soak it all up. It is just right when you can taste the salt and would usually think it was too much. Stir well while bringing it to a boil, then remove the saucepan from the heat. Arrange the potato slices in overlapping layers in the prepared dish. Evenly spread the Brussels sprouts in a top layer. 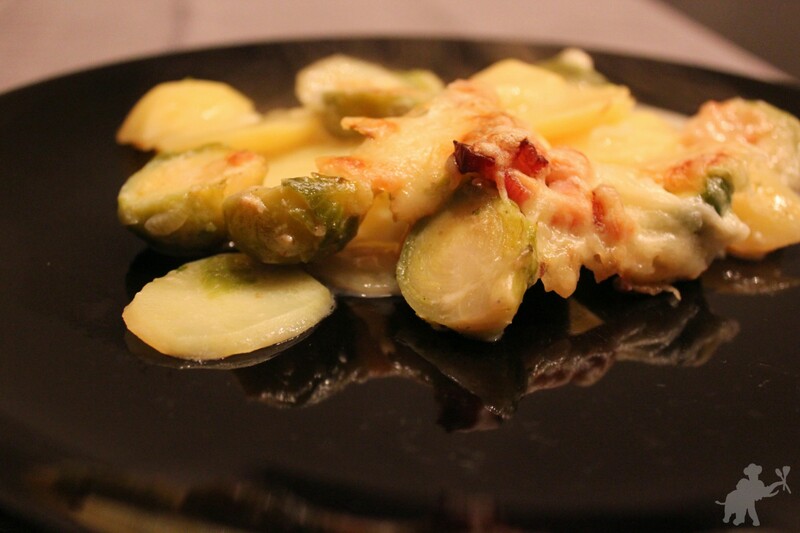 Pour the cream over potatoes and Brussels sprouts, then sprinkle with cheese. Bake for 40 minutes. Bon appetit! Cooking, Veggie of the Month. permalink.